Camera companies often slice camera bodies in half to show off the inner workings of their new products at trade shows, but the Waterjet Channel kicks it up a notch by slicing a Canon camera body with the lens attached in half. Don't try this at home! C'mon folks, give DP a break for showing this. I know exactly how this water jet works, and still found it interesting. I suppose that I could complain whenever a camera of a brand that wasn't mine was tested for photo use, but that would obviously be silly. This is large website with lots of information; if you don't want to see something, don't watch, or perhaps I missed a clause here that forced you to see this? This isn't news people. Nor is it that shocking either. The manufacturing industry has been using techniques and technology like this to cut steel (among other methods, but this is not rocket science or anything new). Nothing new here. But I will say that I do agree with some that it does offer a nice cross-section view of the innards of a DSLR. And yeah, a hydrualic press can smash a camera into a pancake. Who cares? It can also smash your hand into a pancake too, did you know that? Or that this 60,000 psi tool can cut your arm off. Come on, DPR. Is this really news worthy..? I thought this camera was water resistant. I'd like to them do that to a 5D IV. For obvious reasons. What a set of miserable gits there are on this site. As an engineer and a photographer, I found this fascinating. The point of it was to demonstrate what a clean cut could be achieved using that technique and thereby showing a very interesting cross section of the inside of a camera. What true photographer would not be interested in seeing that? Pot that in a clear resin and it would make a great decorative piece. I could care less about the camera and want to know more about that water jet. the irony is that those people writing here with emotional responses are most likely increasing the likelihood that articles such as these will get posted on this site by creating more discussion and adding to the total comment count. the smarter thing that they could have done to get what they want was to not react at all. These guys don't exactly sound like rocket scientists. Or even scientists. what's the point doing this ? A bunch of photographer on dpreview necessary watch this thing, really ? Does it related to what photographer do, actually ? so, Apple and Samsung made the smartphone for that purpose, REALLY ??? I got better idea ! show it here in dpreview and we will rate the effort in making those image ! Lighten up! This is interesting. I hope the camera was waterproof. Came to check the bitter hateful comments from the people who wants to save every DSLR ever manufactured. I can never understand the presence of these things in an otherwise useful photographic website. Regular news sites also report when people gets chopped in half. 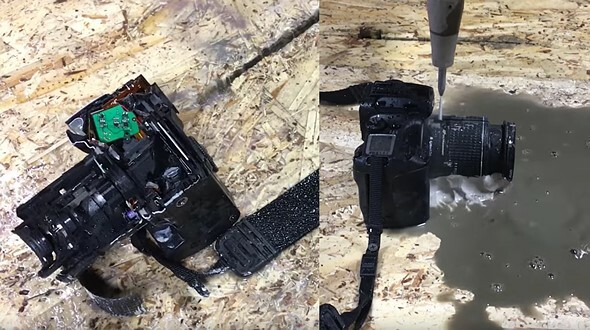 Cameras are fun, and so is cutting them in half with water. Not every story has to be a serious technical paper about pixels. If you put the bits in a bag of rice, would that get the water out? This video is relevant to my photographic interests. If it is that relevant then you should be spending time talking and visiting universities, r&d labs and mining companies... you will get way more info from doing that than watching a dumb video destroy a camera... ymmv. I enjoy cameras, and I enjoy things getting cut in half. Sometimes it's nice to have a break from super serious issues like the 100th version of a Sony compact camera, or the 5D Mark XXI. oh so hearing about endless camera specs is relevant to photography? Best bit for me: Non-camera guys inspecting the pentaprism, "...is that a giant block of glass right there?" Is the jet water alone, or does the jet contain abrasive? It contains abrasive. Water alone doesn't do it. I've seen these old Canon SLR's selling for $5.00, in a store. They have little value or appeal to users of old equipment, who generally prefer something older or better. It's no different than cutting an old toaster or microwave apart. It'll all end up recycled anyway. Far worse things have been done to better cameras. I saw an exhibit of photos about five years ago where the artist had taken one photo with one camera (there were a slew of them) and they destroyed the cameras which were pasted alongside the images. There were some good film cameras there, including a Pen F with a fast lens. This "old Canon SLR" would fetch a nice few hundreds of euros; they're not just AE-1 (old school FD) or some x00 series; it's an EOS30 (known under various other names) which implements a very unique technology: Eye Control for the focusing points. Even if just as a curiosity for the collectors that actually shoot at least a roll every year with the cameras they have, and it would still find a better use. They're cheaper on Ebay. Not as cheap as some Canon bodies, granted. 1980's bodies the plastic ones are for the most part, highly undesirable. Unlike all metal bodies from the 70's. "nice few hundreds of euros" for this one would be a theft! Not $5 still. People that like fun stuff. Nothing wrong with that. It was a DSLR and it was pointless. Not a DSLR- it was a film camera. One of the stupidest things I've ever seen. Couldn't help but notice the filter on the front of the lens did not save it. I would drive 50 miles to buy you a coffee for that comment alone. This should be part of DPR's standard set of tests. Come in handy for the mod/s on the Off Topic forum! Sorry dude, I can understand that one may think that Canon's M-series of cameras lack some features in comparison to it's peers, but one can't say they are bulky. The opposite is the case. The whole system is about compactness. If the camera takes photos then surely there's substance enough. This is not a new camera. this should be the water/weatherproofing benchmark. "The Olympus EM1 MK II is built to withstand even the harshest and most demanding conditions" says Olympus. what is the table top made of? The top looks like OSB which is composed of wood flakes pressed with glue under extreme pressure. At least it wasn't a Nikon. Yes, but does it do 4K? How impressive. I might want to remind you though that you just commented on a video that you never watched. For sale: Gently used Canon EOS ELAN 7E with zoom lens. Half off. DUMB AND DUMBER meets JACKASS! So totally RAD so UEBERKUHL, so so so...FETCH! That'd be a sweet "Pintrest-y thing" to frame and display somewhere. Is it only me, or does the build quality of the Canon seems suspect? Very interesting! I always wanted to see how they sliced cameras and lenses and stuff. Thanks! So how long did it actually take to slice that camera in half? Missed opportunity there. They could have done that while the camera is taking a video. I knew it! Those Canon bodies are not waterproof!! I like this type of video in general, but this one was made by idiots. If I were doing this, I'd know what a pentaprism is. It felt like they were trying to impress the audience when using simple words like "concave" and "convex." If I were doing this, I'd use a video-capable camera, and leave it filming for as long as it would during the cut. If you had wheels you would be a bus. ♪ ♫DUN DUN DUN ♪ ♫ "FINISH HIM"
Camera: do expect me to talk? Water jet: No, Mr. Elan, I expect you to die! So what is the practical target of this barbarically made test? Power of overpressed water gear? Dead camera body turned inside out? Why? you misunderstood, it wasn't a test. yup. it wasn't a test. there are plenty Youtube channels just for the destruction of anything under the sun. I hope you can find some comforting "safe space" and recover quickly from your shock. Because destroying things can be fun? I had EOS 5, yes the ECF was amazing. Canon doesn't produce ECF cameras because Japanese govt. don't allow Canon to export this hi-tech product outside Japan. You can feel the suffering of the camera by looking at its blinking light.